Home Improvements = Savings Account? It’s the garage! Think about it. How many people actually pull their vehicles into the garage everyday and use it for vehicle storage ONLY? Not many. If you’re like many builders and remodelers, the last few years have been slow as homeowners stay put in their current homes rather than trying to sell, build or even do large remodeling projects to add value. Give your remodeling clients the closet of their dreams! Closets are no longer just a place to store clothing and household belongings — they’re an integral part of the home’s overall design. 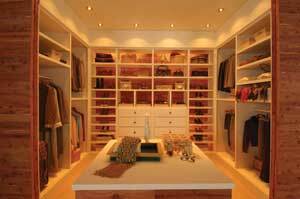 Homeowners want closets that are spacious, stylish and full of personal touches. We found a great round-up of photos from all over the web of closets your clients will love for their new home or remodel. Going green? Start with cedar! Need organizing tips? How about 99? Did you know you can remodel your closet with natural aromatic cedar for as little as $150? And you can do it yourself! Start your project by using our easy-peasy closet planner.